Into Space 3 is here in this winter physics game and you will need to try your best to send this spaceship into outer space but to do so you will first need to collect some candies from the air as they are the currency with which you will be able to buy some upgrades. Without those you will certainly fail in the effort of reaching high altitudes. Make your way through all these failed launches and hopefully you will need very few of them until you reach the high altitudes needed to complete the game. 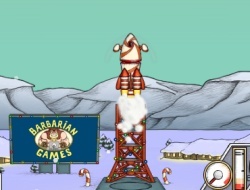 Have fun and try to make the most awesome rocket. Into Space 3 Xmas Story 0.00 between 0 and 10 based on 0 votes.